Now that spring is in the air, and while I was on my little blogging hiatus that lasted longer than I anticipated, I made a few trips to the store for some items I had postponed buying long enough that they became necessary. (That's how much I love to shop, by the way.) While I was there I detoured through the kitchen section to see what new things I could add to my "want that" list. What I found were some nice glass storage jars at a reasonable price so I grabbed some. And immediately put the fantastically fresh dried beans I have been buying from the Three Sisters Garden at the Green Market this winter into them (there they are in the left-side case, on the right side of the third shelf from the top). They looked so pretty I decided to go back for more jars. They were out of that size but I got the next size larger for my raisins, and then I saw a beautiful stainless steel canister set that looked like it would be perfect for the many nuts, seeds and grains I always have on hand. I bought two sets of those, which you can see on the top shelf of the left side and the second shelf from the top on the right side. 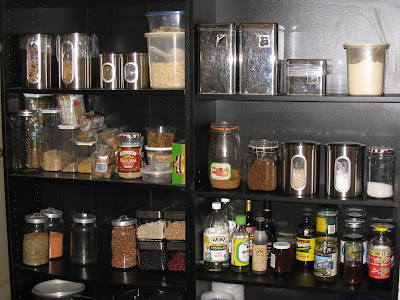 What started as a simple switch-out of a few containers culminated in a full-on purging of old items, wiping down of shelves, rearranging for maximum effect (and efficiency), and the beautiful array you see spread before you on my pantry shelves. The impulse even spread beyond the pantry and into the kitchen itself and the closet where I store my pots and pans. The end result was a leaner, cleaner cooking area that once again tempts me into the kitchen so I can play with all of these delicious toys. So if you need to do a major overhaul of your cooking space but just can't get yourself motivated, allow me to suggest that you obtain some pretty new kitchen items to provide that little boost you need to get started. Once you start you will be amazed at how quickly and easily the task can be accomplished.